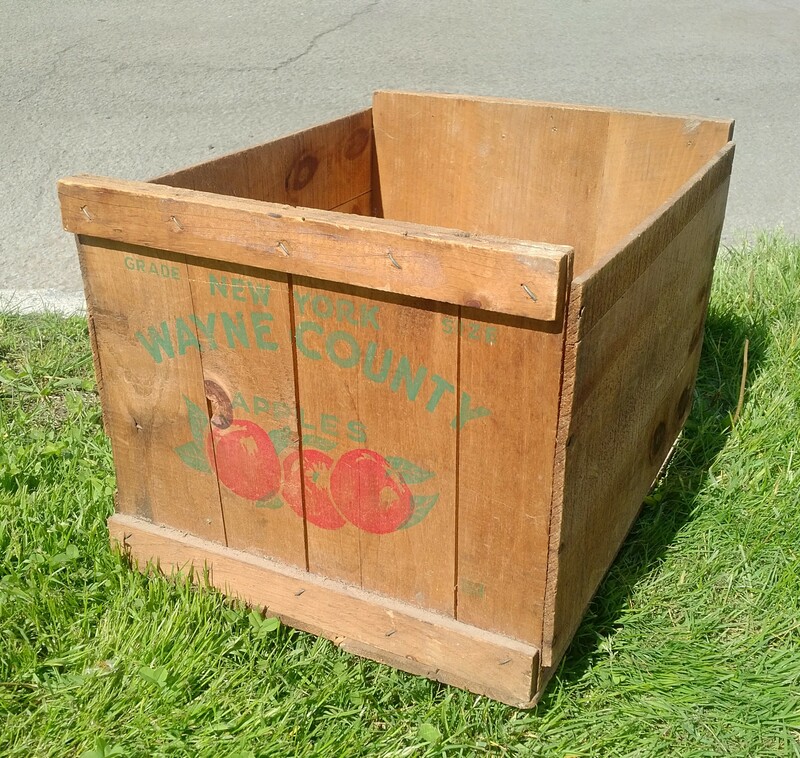 I’ve been going through an “upcycle recycle” wooden crate phase of late, and my most recent acquisition is this Wayne County apple crate. 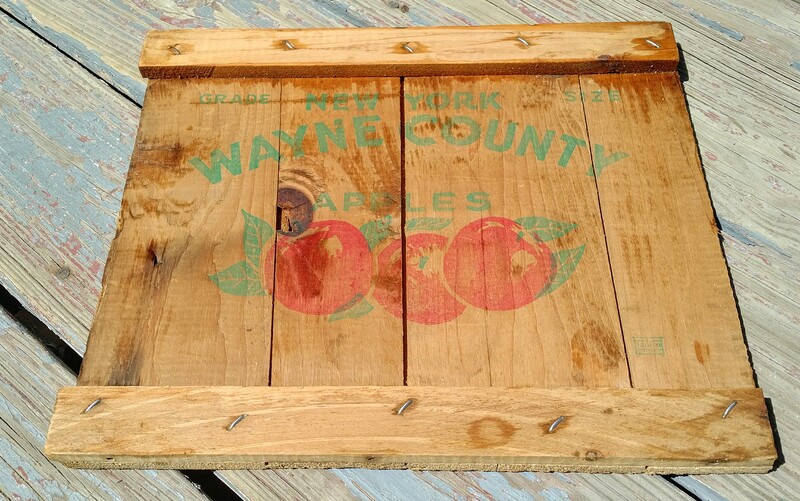 That’s a cool logo on the front of the crate – NEW YORK WAYNE COUNTY APPLES on the front, along with a few painted apples to effect. These old planks won’t stand a chance against my hammer. Bang bang I shot them down. Then I wiped the surviving panel down with soapy water, to remove the dirt and grime of age. 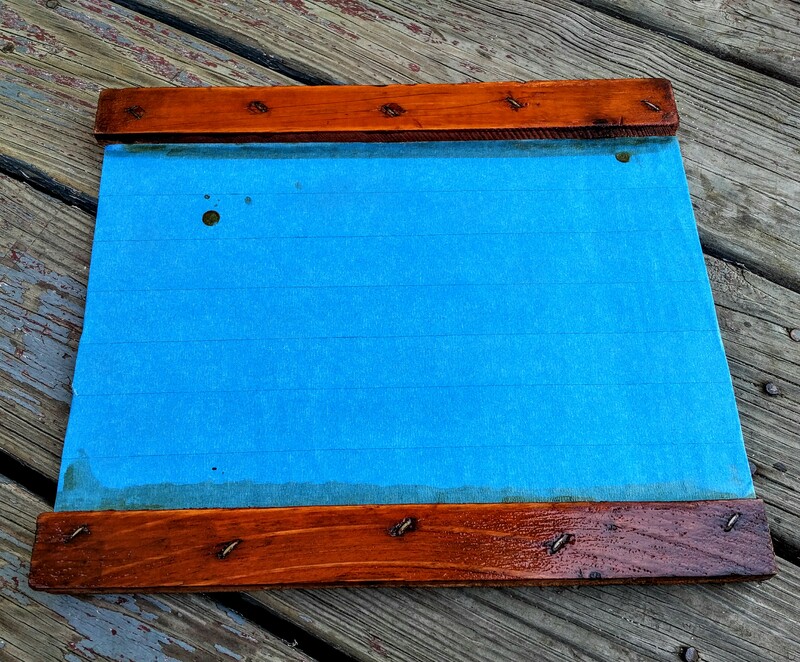 If you look at the top board on this panel, you can see what appears to be some old tape residue. I can’t have old tape residue in this artwork. No way no how. I had to sand that off. 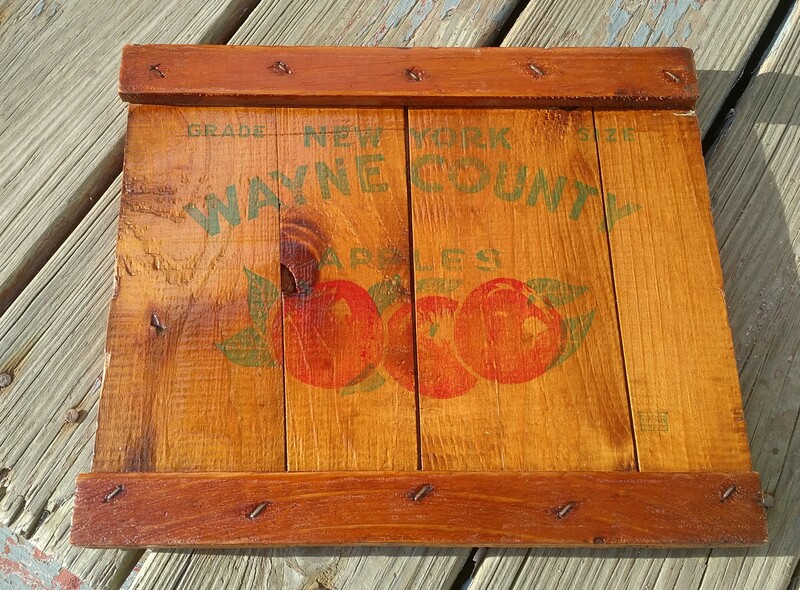 Then for good measure and balance, I sanded the lower board as well. 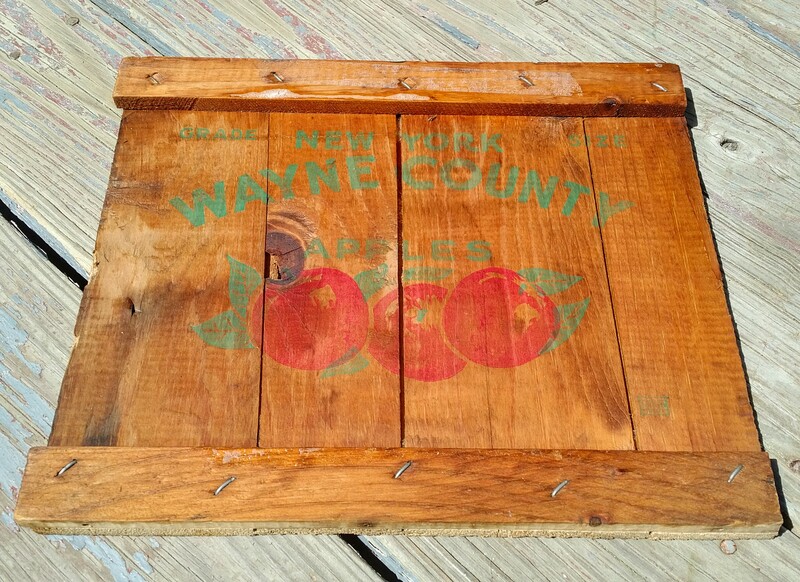 This old crate needs a nice coat of shellac. I had two cans of leftover shellac handy – one can of amber-colored shellac, one of clear shellac. 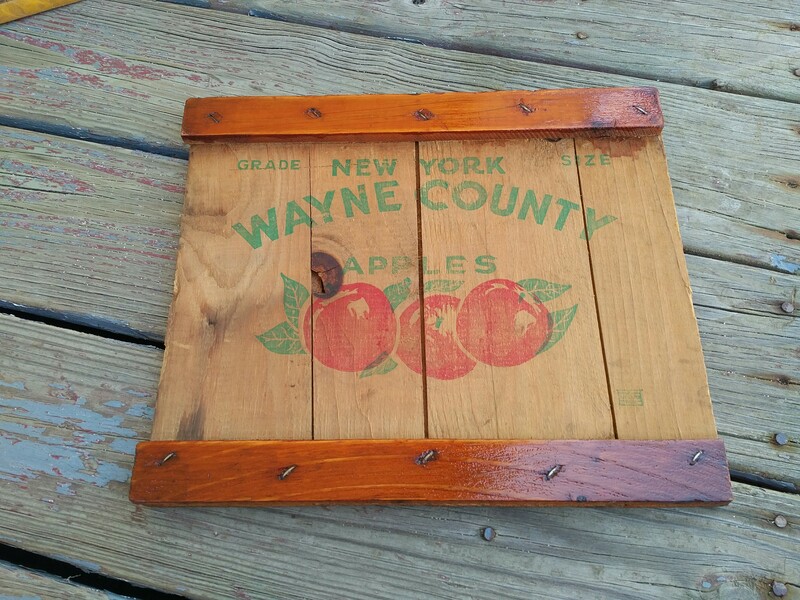 I decided that the horizontal bracing boards would receive a coat of amber shellac, while the clear shellac would preserve the vintage advertisement. Blue painter’s tape to protect the advert. Then some coats of amber shellac on the horizontal boards. That’s three or four coats of shellac on those boards, with some sanding between coats. Now that looks amazing. A little wire for the back, and this is ready to go. Simple answer…. as many as I want to. I’m feeling extremely creative right now, and these crate projects are actually stimulating something in my brain that I may not have previously used. It’s similar to my work with the K-Chuck Cabinet project last year, where I turned an old highboy radio cabinet into a swank storage hideaway. And maybe through all these projects, I’ll find something in myself – a creative spark – that will generate something spectacular. It’s like I have an idea tucked away in the back of my brain, and I’m trying to find something, anything, that can pull that idea out and make it tangible and visible for all of you to enjoy. I know the ideas are there. I just have to bring them from the imagination to the realization. And in the end, isn’t that the best part of the creative process?